The full arc-continent collision zone of Taiwan is marked by the Taiwan orogenic belt, the west Taiwan foreland basin, together with the accreted Luzon arc in the east, manifested itself as the Coastal Range . Our recent efforts on this tectonic domain place on the Cenozoic tectonic development in the China continental margin and the strength of the Taiwan lithosphere. Details are given below. Seismic reflection profiles and well data are used to determine the Cenozoic stratigraphic and tectonic development of the northern margin of the South China Sea . In the Taiwan region, this margin evolved from a Palaeogene rift to a latest Miocene-Recent foreland basin. This evolution is related to the opening of the South China Sea and its subsequent partial closure by the Taiwan orogeny. Seismic data, together with the subsidence analysis of deep wells, show that during rifting (~58-37 Ma), lithospheric extension occurred simultaneously in discrete rift belts. These belts form a > 200 km wide rift zone and are associated with a stretching factor, β, in the range ~1.4-1.6. 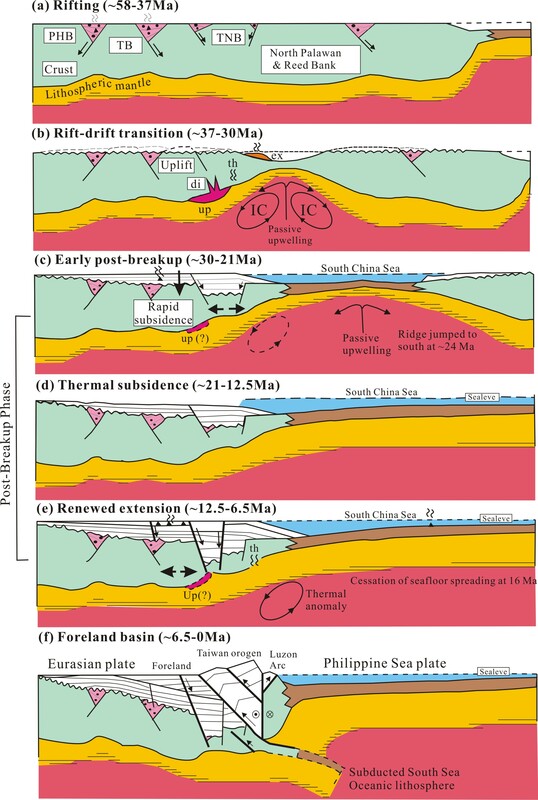 By ~37 Ma, the focus of rifting shifted to the present-day continent-ocean boundary off southern Taiwan which led to continental rupture and initial seafloor spreading of the South China Sea at ~30 Ma. Intense rifting during the rift-drift transition (~37-30 Ma) may have induced a transient, small-scale mantle convection beneath the rift. The coeval crustal uplift (Oligocene uplift) of the previously rifted margin, which led to erosion and development of the breakup unconformity, was most likely caused by the induced convection. Oligocene uplift was followed by rapid, early post-breakup subsidence (~30-18 Ma) possibly as the inferred induced convection abated following initial seafloor spreading. Rapid subsidence of the inner margin is interpreted as thermally-controlled subsidence, whereas rapid subsidence in the outer shelf of the outer margin was accompanied by fault activity during the interval ~30-21 Ma. This extension in the outer margin (β ∼ 1.5) is manifested in the Tainan Basin which formed on top of the deeply eroded Mesozoic basement. During the interval ~21-12.5 Ma, the entire margin experienced broad thermal subsidence. It was not until ~12.5 Ma that rifting resumed, being especially active in the Tainan Basin (β ∼ 1.1). Rifting ceased at ~6.5 Ma due to the orogeny caused by the overthrusting of the Luzon volcanic arc. Lin, A.T. , Watts, A.B., Hesselbo, S.P. 2003. Cenozoic stratigraphy and subsidence history of the South China Sea margin in the Taiwan region . Basin Research, 15 (4), 453-478. Seismic and well data suggest that the West Taiwan basin developed by orogenic loading and flexure of a rift-type continental margin. The most likely source of the loading is Taiwan, where oblique convergence between the Eurasian and Philippine Sea plates has produced an orogenic belt up to 300 km in length, 100 km in width, and 4 km in height. Flexure modeling shows that surface loading is unable to explain the depth of the West Taiwan basin. Other, subsurface or buried loads are required. Combined surface and buried loading explains the depth and width of the basin. It also accounts for a Bouguer gravity anomaly ‘‘high’’ and flanking ‘‘low’’ over the orogenic belt, a lateral offset of 20–30 km between the peak topography and the maximum depth to the seismic Moho, and evidence for tectonic uplift in the Penghu Islands. The depth of the base of the foreland sequence in the northern part of the West Taiwan basin can be explained well by an elastic plate model with an effective elastic thickness, Te, of 13 km. While this value is low when compared to most other foreland basins, it is within the range of values derived from rifted continental margins. The northern part of the West Taiwan basin unconformably overlies a passive margin sequence and therefore appears to have inherited the long-term (>1 Myr) flexural properties of the margin. In the southern part of the basin, however, the depth to the base of the foreland sequence dips too steeply to be explained by elastic plate models. This part of the basin therefore appears to be yielding rather than flexing. Differences in the flexural behavior along strike of the West Taiwan foreland basin lithosphere are reflected in seismicity patterns west of the thrust front. The northern part of the basin is associated with a low level of seismic activity, while the south correlates with an abundance of earthquakes, especially at shallow (<25 km) depths. There is a cluster of earthquakes along two extensional faults that were active during rifting of the underlying margin. Therefore lithospheric flexure and fault reactivation may be important contributors to the seismicity of the Taiwan region. Lin, A.T. , Watts, A.B. 2002. 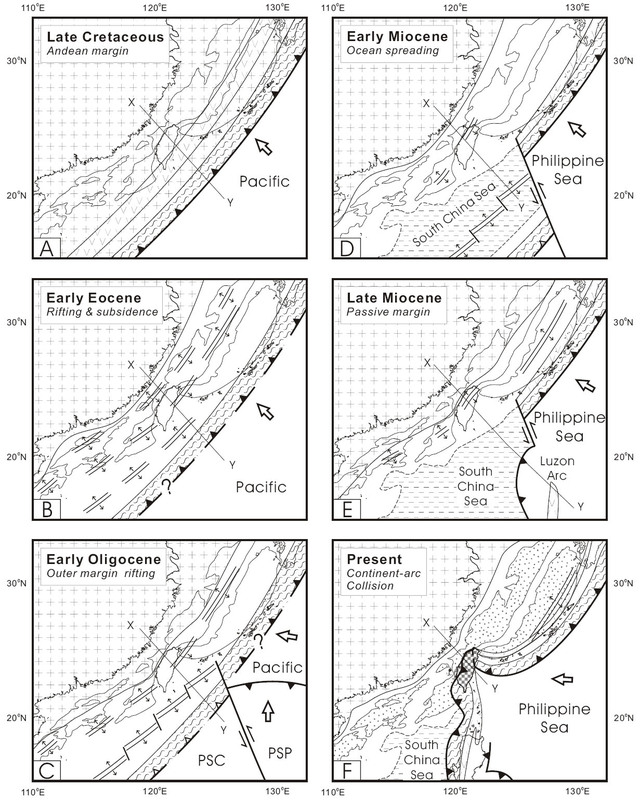 Origin of the West Taiwan Basin by orogenic loading and flexure of a rifted continental margin . Journal of Geophysical Research , 107(B9), 2185, doi:10.1029/2001JB000669. The continental margin to the east and south of China comprises an active margin in the East China Sea, a collision mountain belt in Taiwan , and a passive margin in the South China Sea . These three segments were generally regarded as separate tectonic entities and their interrelations have long been the subject of debate. We synthesize available information to outline the tectonic and geological background of the China margin, examine the link between Taiwan and the neighbouring China margins, and thereby establish a Cenozoic evolutionary model. The China margin is floored with a pre-Cenozoic continental basement covered with an up to 10-km-thick pile of Cenozoic sedimentary strata. The continental basement has been invariably stretched and molded into a series of northeast-trending horsts and grabens. Except in the Okinawa Trough of the East China Sea , the Cenozoic sedimentary cover typically exhibits a two-tier tectonostratigraphic structure, with narrow Palaeogene rift basins draped by a blanket-like Neogene-Quaternary sequence. The two-tier structure prevails in the entire inner part of the China margin, including the Taiwan Strait off western Taiwan . In the outer China margin, however, the two-tier structure persists only in the South China Sea, and is in stark contrast with the collisional orogen of Taiwan and the Ryukyu arc of the East China Sea . By untangling the contractional deformation of the northern Taiwan mountain belt, it has been possible to reconstruct a precollisional tectonostratigraphic section with a distinctive two-tier structure shown by a Palaeogene half-graben covered with a Miocene drape sequence. When put together with Palaeogene rift basins of the Taiwan Strait, it becomes clear that the precollisional continental margin of Taiwan resembles that of the South China Sea , characterized by two lines of Palaeogene rift basins. Hence before the collision started in Late Miocene times, Taiwan was part of the passive South China margin that extended northward to the southern Ryukyu area. Ever since the end of the Cretaceous, the China continental margin has been dominated by extensional tectonics, regardless of the presence or absence of subduction zones. In the Early Cenozoic, extensive crustal attenuation resulted in region-wide subsidence and formation of rift basins. Extension in the South China Sea culminated in Late Oligocene times, when part of the outer margin was drifted away by the opening ocean basin. In the East China Sea, the margin remained intact and became separated from the South China Sea margin by a transform fault. From the Miocene onwards, the South China Sea margin has been passively subsiding, sporadically punctuated with basaltic volcanism. In the East China Sea margin, the Okinawa Trough has opened and the Ryukyu volcanic arc thrived. 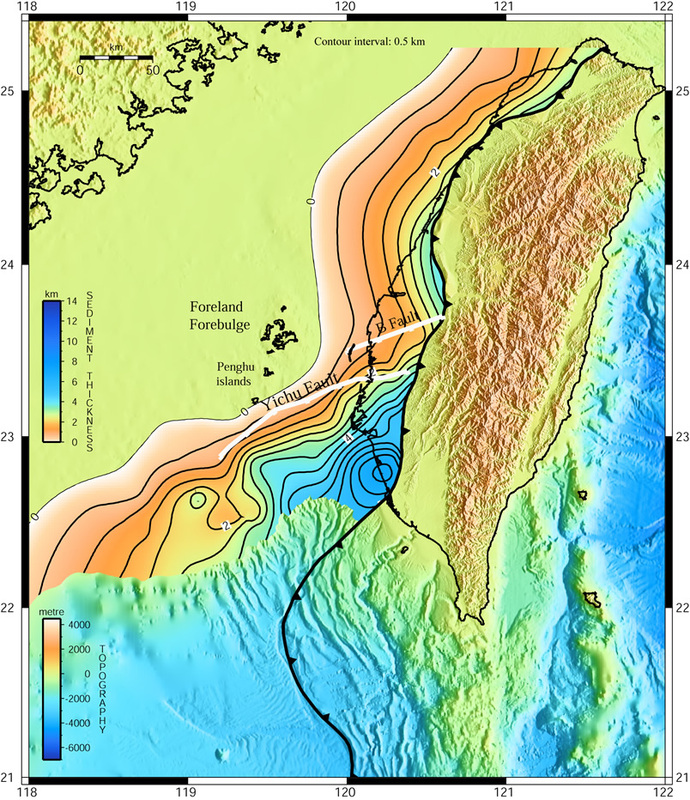 The NE edge of the South China Sea margin was deformed as the Taiwan orogen. (Teng and Lin, 2004; in Special Publication, Geological Society of London).